The "Boat Section", constructed in 1970, is comprised of reinforced concrete substructure topped with a lightly reinforced PCC wearing pavement surface. The substructure consists of two different structure types, a gravity section and a pile section. These sections function to resist the buoyant forces of surrounding groundwater and seal the groundwater for the roadbed. Over time, leaks have developed around the joint seals, which had caused damage to the wearing surface. 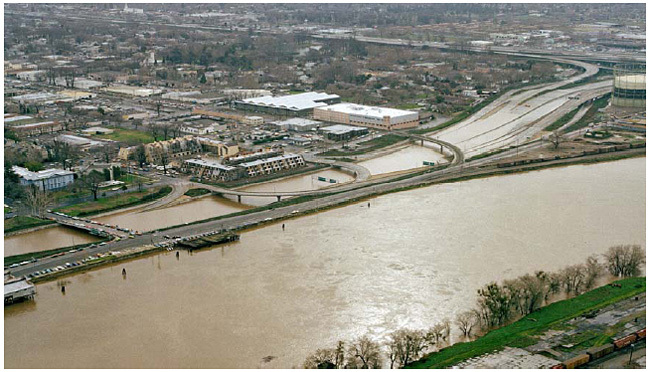 The seal slab is sensitive to forces applied by groundwater, which is influenced by the Sacramento River stage elevations. Groundwater elevations are controlled during flood stages by a protective de-watering well system that activates at critical high elevations. It de-activates before subsidence occurs. Surface drainage systems were provided to carry away both infiltrated groundwater and surface water runoff. However, the existing drainage systems had become partly plugged and partly ineffective. Figures 1 and 2 below illustrate the "Boat Section" submerged in water during a flood event in January of 1980. A variety of repair materials have been utilized, attempting to seal the surface cracks, with no success. The high Average Daily Traffic (ADT) of 190,000 (2006 Traffic Volumes) and reduced shoulders on this section of the roadway make repair work difficult. The maintenance history for the "Boat Section" seal slab dates back to original construction. 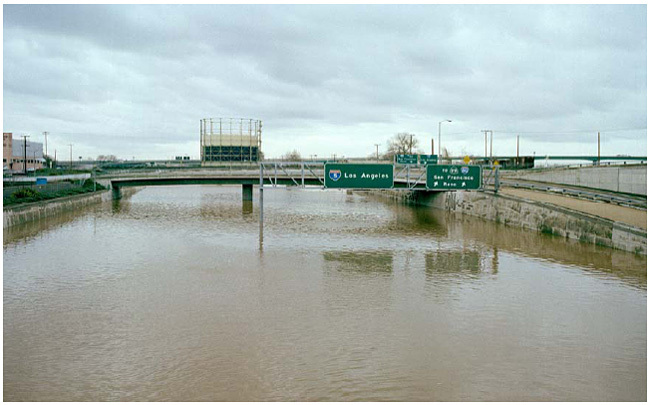 Currently Caltrans Sacramento Area Bridge Crew spends approximately 20% of its annual budget on the "Boat Section" seal slab. The I-5 "Boat Section" Rehabilitation Project proposes to address the chronic wet pavement and deterioration of the wearing surface in the depressed structure. Remove and replace wearing surface of the seal slab (Bridge No. 24-274M). Repair leaking joints and seals. Install instrumentation in the slab to monitor critical pressure. Install additional de-watering wells to help reduce buoyant forces on the seal slab due to high groundwater elevations during flood stage events of the Sacramento River.